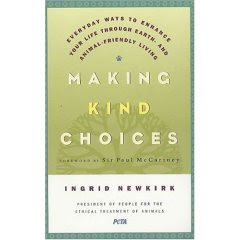 I highly recommend this book, Making Kind Choices, written by PETA President and co-founder Ingrid Newkirk. It is not a straight read-through but more like a handbook. It offers tips on making changes in our daily lives to avoid harming Mother Earth and our animal friends. This lifestyle can only enrich our lives.